The sale of the controversial Barbie doll of Frida Kahlo is prohibited in Mexico, as decided by a court in this country. A judge of the Superior Court of Justice of Mexico City ruled in favor of the family as holder of the rights to the image of Kahlo, one of the most important Latin American artists of the 20th century. 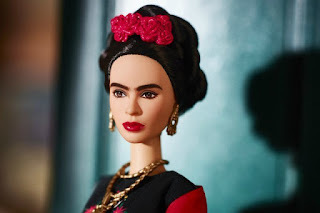 The ruling says that Mattel, Frida Kahlo Corporation and other companies can not market the image of the painter on a doll. The Mattel brand could appeal this decision. This brand of toys launched worldwide in March, on the occasion of International Women's Day, a collection of dolls to honor "women who inspire." Among them was the Mexican painter. Some relatives of Kahlo denounced that Mattel had used the image without their permission. Mara Romero, niece granddaughter of the artist, assured that her battle is not only about rights, but about the artist's representation. "The doll should have been much more Mexican, with a darker skin color, with a single eyebrow, not so thin because Frida was not like that, and dressed more Mexican, with Mexican jewelry," Romero told AFP. Of the decision of the judge of Mexico, the niece said: "I am delighted because I believe that justice is being done." The court's decision to ban the doll only applies to stores in Mexico. The family's lawyers say they will wait for the possible appeal to launch a similar lawsuit in the United States. For its part, Frida Kahlo Corporation says in a statement that it has acquired "all rights worldwide and without any limitation" since 2005. The company says it will continue to sell the doll "within the framework of respect for the law and in the exercise of its constitutional rights." It also says that the family did not present the claim within the period established by law "evidencing once again the malice and fraud of these unfounded claims." "Frida Kahlo's Barbie doll was launched worldwide and has been very successful, and wherever it has been sold, it has run out," Frida Kahlo Corporation spokeswoman Beatriz Alvarado told BBC News. Kahlo lived from 1907 to 1954 and was very active in the Mexican Communist Party. With her art and her way of dressing she promoted the indigenous culture. She was the wife of the famous muralist Diego Rivera. In her time, she challenged social norms by wearing pants and having relationships with men and women. Her work also portrayed in her paintings the tortuous relationship with her body. She had to wear corsets that caused her a lot of pain due to an accident she suffered as a teenager. She also suffered from polio and spina bifida. These characteristics were also not represented in the Barbie doll. Among the other 17 women that Mattel chose to represent in Barbie dolls is another Mexican, the golfer Lorena Ochoa.